Sherre told me a few years back that she had cancer. I knew immediately and without doubt it would kill her. Not nice words or thoughts, for sure. Sherre even got a couple of reprieves, after all, she was a fighter. But this last time cancer came for her, I knew her time was running out. Am I telling you how wonderful I am because I know that cancer can and will take whatever life it can? No. I have worked with oncology patients and most recently radiation oncology patients, plus my family is riddled with cancer. I know by now there is almost a direct correlation to how nice, thoughtful, kind you are and how fast the cancer takes you down. In my experience, cancer kills the very best, before their time, before it is just. Maybe it is a way to get the rest of us from being so complacent. If cancer kills the finest of us, shouldn’t the rest of us get on the band wagon and find a way to beat this monster down? Lauren and I met Sherre one day at a horse show. We had our Corgi, Sneaky, for about a year and were looking to breed her to a fine male and have at least one litter of puppies. We spotted a beautiful Corgi at the show and we walked over to introduce ourselves to Sherre. She told us all about her Corgi, Nordic. He was destined to be neutered but Sherre said she would consider letting him sire one litter before that took place. We agreed we would call Sherre when Sneaky was ready. Lauren and I walked away from the elaborate stall drapes and high dollar horses that Sherre worked with back to where we were still showing Mickey in hunters. We did not know much about this new “A” show world but we had just made friends with someone who was certainly at home in this environment. Time came for Sneaky to be bred and off to Sherre’s we went. First, to her beautiful home where she made us all feel comfortable ( as Nordic chased Sneaky around in vain) to the barn where she worked which was built with standards much higher than those used to build my home. But never once did Sherre make us feel uneasy or unwelcome. We told her our dreams of getting Mickey solid at the 3’6″ jumps and she encouraged us. She talked with Lauren and give her tips. In the end, Nordic and Sneaky never consummated their love affair but Sherre was to be our friend forever. 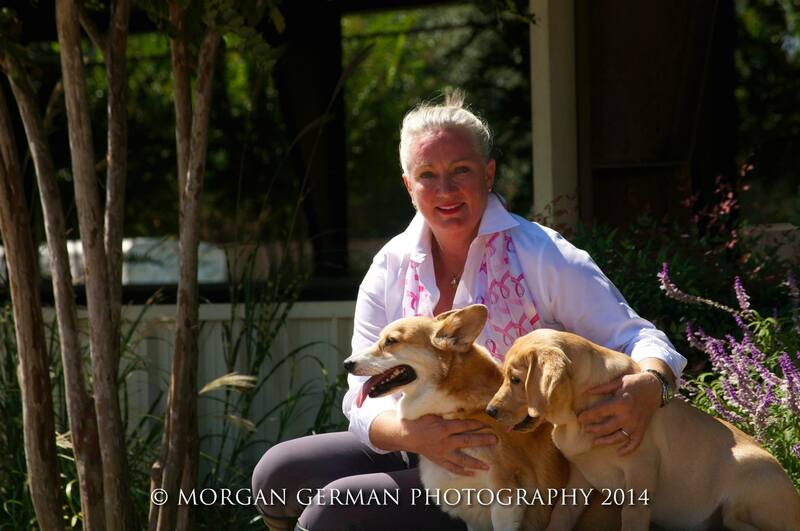 I talked Sherre into doing a clinic at the barn Lauren rode at in those days. It was so well attended it took us all day for her to coach almost 60 riders through their paces. Lauren and Caitlyn Epperson attended. It was a day about getting back to riding fundamentals. Sherre taught traditional riding and it worked. When Lauren wanted to attend the USEF Emerging Athlete Program, Sherre wrote a recommendation letter for Lauren. It meant a tremendous amount to us. And through the years, no matter how busy Sherre was with her own riding and her own students, she always took time to visit with Lauren. Sherre would spot Lauren in the warm up ring and I would see them deep in conversation. She would encourage Lauren during her Mickey days and applaud her progress as Feather moved up through the ranks. She was the best possible mentor Lauren could have. I was always so thrilled to see her white blonde hair blowing in the wind as she took a moment to bolster my daughter’s confidence just by her few simple words. Our Bruno came from friends of Sherre’s family in New York. Then came Bruno Sims into our life. 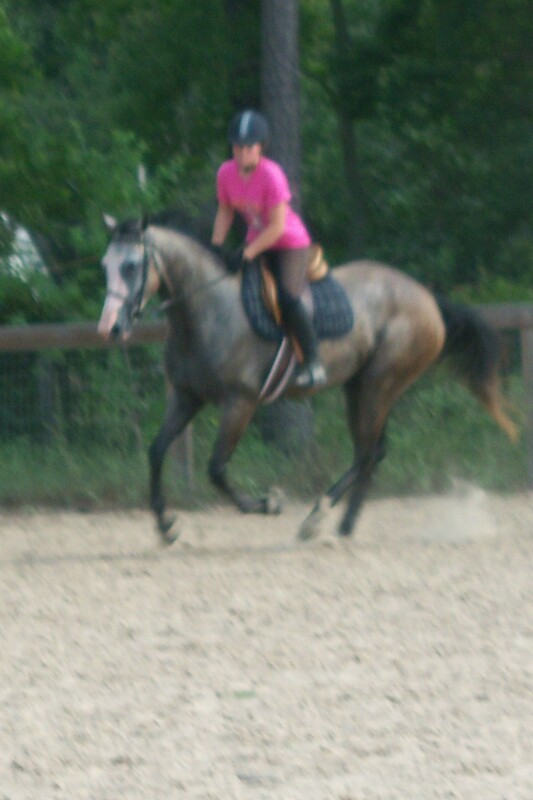 Bruno, a huge OTTB, came into our life from Sherre via our trainer Dev. He had hoof problems I thought we could heal. Sherre and I had long conversations about the choice I was making to send him to Texas A&M for surgery. In the end, he did not live to grow old. But he fought and we fought to keep him alive and sound. I suspect that Sherre was concerned about this free horse that in the end cost us so much. But she gave us a tremendous gift with Bruno. He was one of kind. We loved this giant horse like no other. When the cancer took hold, it didn’t change Sherre except maybe to make her kinder and more patient. She held on to her internal and external beauty as the disease ravaged her core. Sherre was an avid reader of my blog. I did not know that until Feather’s first horse show at the GSWEC. Lauren was taking Feather in to do the baby greens in the East Arena, Cookie was talking to judge. Feather caught their movements out of the corner of her eye and shied away from the judge’s stand. It was then I recognized Sherre as the judge as she said “Easy, Feather! It is okay, Feather”. Apparently, Sherre had been reading along in the blog and knew that the horse announced as Flagmount’s Irish Freedom was my Feather making her debut in the ring. Sherre’s passing has brought a fountain of sorrow to this horse world and this horsewoman. Yesterday, the activity ceased at the Great Southwest as the trainers learned of her passing. Nothing seemed to move, time stood still. She was the best of them in many ways. But Sherre has left us a fountain of life as well. A simple daily challenge I will try to meet to be more kind, patient, caring, and full of life. Each day we are given opportunities to help someone brighten their day. Simple opportunities to share the fountain of life. I am so happy that Nordic brought us to Sherre and Sherre brought life and color into our world. I will be forever grateful. When we met Sherre I felt she looked familiar. She was the quintessential equestrian, classic in her look and clothing, but it was more than that. When I saw her truck, I remembered. Did you ever see this? I remember Lauren being a teenager when this came out. We were even inspired by this ad. To be professional horsewoman (and a beautiful one too!) and trailer your horses to shows-to be able to really live the life-that what this ad meant to Lauren and I. We never dreamed the beautiful lady from the ad would end up our friend. 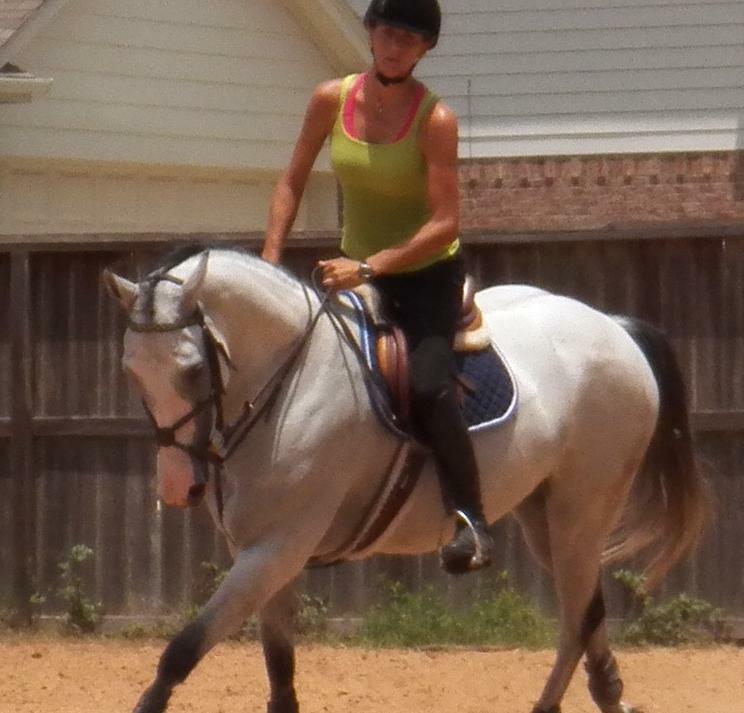 Horseback riding is not the first thing you think of when you think of physical fitness regimes. People run or swim or do spin classes to get fit. Seldom do we think about what it takes-physically- to ride a horse. In fact, I cannot tell you the number of times that Lauren and I have argued with people in this town about horseback riding being a sport. It started with her physical education department at her high school. 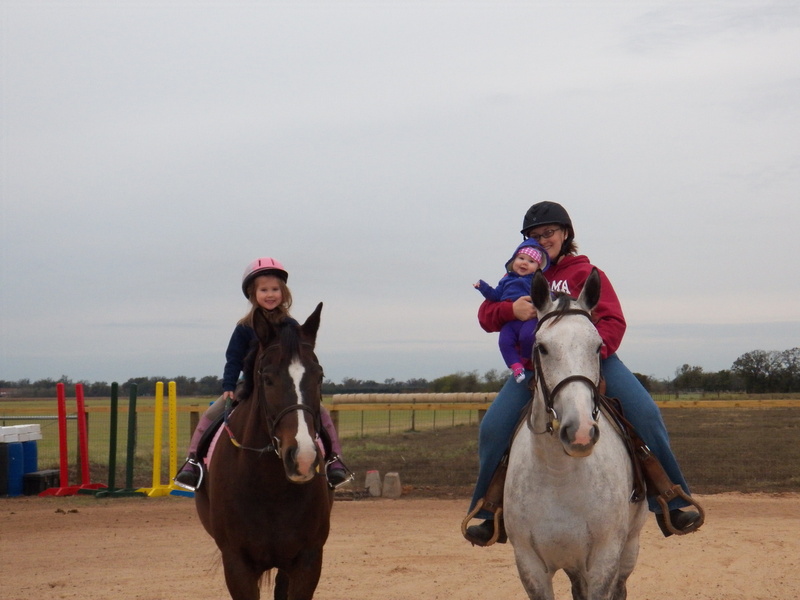 Other school districts in the Houston area, acknowledged that horseback riding was a form of physical fitness and allowed students to do horseback riding as an offsite PE credit for their high school program. Not in El Campo, Texas was that acceptable. 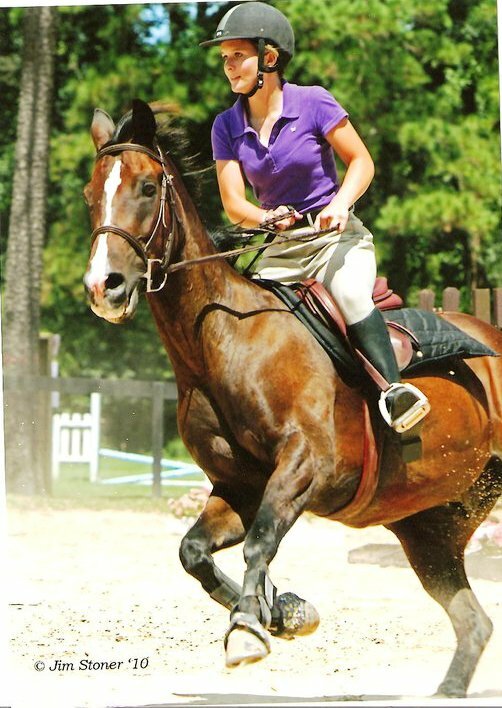 In fact, at the time Lauren had qualified for the USEF Emerging Athlete Program (EAP)- a national program led by former Olympic medalists and she was hoping to attend a college and qualify to ride on a NCAA Equestrian Team. But the answer in El Campo was still no. It may be a sport at colleges throughout the US but horseback riding was not a sport in little town Texas. I would challenge anyone who feels horseback riding is not something that requires athleticism and physical fitness to try to ride Mickey through a three-foot course. Good luck with that! One of my favorite examples of riding requiring physical fitness was when one of Dianne’s riders that had ridden successfully as a youth decided to return to the show ring as an adult. John was a good and competent rider as a youth. 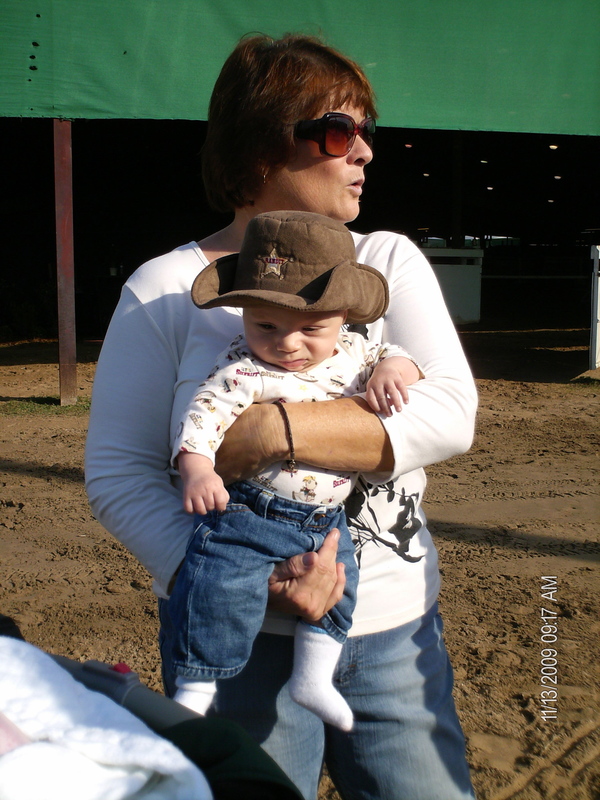 He was riding a strong thoroughbred named Dolan donated for Dianne’s use by Dr. Lynn Criner. I remember John heading into the ring for his first round over fences. His jacket didn’t quite button anymore (and whose idea was it to ride horses in a jacket and tie?). Several years of smoking had reduced his lung power more than a little bit. Dolan took off at a quick pace, galloping to each jump and clearing them easily. After eight jumps, John headed out of the ring gasping for breath. He had stayed with Dolan but he was breathing hard and his color was not so good. By the time John completed his third round over fences, he said he wanted to die. The jacket was completely unbuttoned, the tie was askew and John could have used oxygen. Really. It took a physically fit man to ride the big thoroughbred through his paces and John was not it. He was not physically conditioned to go along for the ride he had taken. I was vastly amused by John’s problems that day-but I could not have done any better. Ally, four months post-baby delivery came out tonight to start her version of get fit while riding at Granny’s farm. 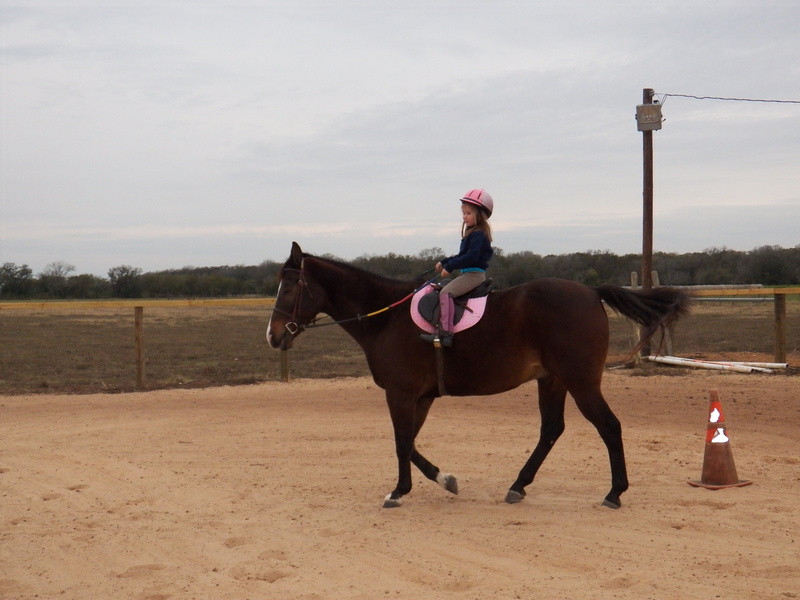 Granny was watching Kendyll and Ally was back in the saddle. It was a windy and cool day but Ally still got in about 45 minutes of serious riding. It is said that riding improves the core muscles (those often slack after baby delivery), it helps tone the inner and outer thighs, improves posture and cardio-vascular fitness. It was fun to have all the girls (Lauren, Ally and Jo) saddled up and in the ring. It has been too long. Still, there is little doubt that Ally will be walking carefully tomorrow. Those muscles that have not been engaged in some time will be yelling out about how they feel. Ask Ally if horseback riding requires physical fitness tomorrow, but stand back because she may come at you, swinging! I may be on to something though and could start post-baby “recover your old body through horseback riding class”. I will let you know if I can get any takers. In the meantime, Ally will be back next week for another go with Feather. Its a blur-would you want to take the chance of falling from five-feet off the ground going 25 miles per hour? The show has gone well. Yesterday not as well as Thursday, but solid rides for Mick and Lauren. Today, they headed into the 1.0 meter (approximately 3’1″) division called the “Low Adults”. This is the division she will ride in the finals coming up in three weeks. Lauren has traditionally had issues with this division. They have successfully jumped 3’6″ inch courses for the last four years. But when we go into the division and call it “the Lows” something psychologically comes over Lauren and she does not do as well. Today maybe five jumps into the course, Mickey refused. He stopped and Lauren went off hard into the jump. We have done this scene multiple times in the past. Lauren came out of the ring, angry and embarrassed. She was mad at Mickey but it was her approach to the jump that made him stop. At this height, she needs to set up him for each jump or he is not going. Lauren wanted to quit. She said she was so tired and Mickey was worn out. Probably so. I told her that was fine but we would not come back to ride finals. 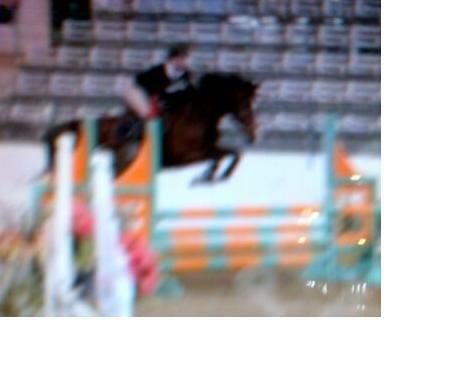 She needed to go back in the ring and try the 1.0 meter class again. We could not give up, then come back in three weeks and think she was going be successful. She did not like my answer. Her trainer gave her some tough love. He told her if she rode well, Mickey would jump well. Neither Dev or I were giving her an easy way out. To the degree I can understand this as I have never faced a three-foot jump, I get that galloping at high-speed toward a solid object on the back of horse is frightening. Lauren has been thrown countless times. Been hurt many times, as well. I understand that giving up is easier than facing down her fear. Dev and I looked around to find Lauren before her next class. She had disappeared. I was not convinced that she hadn’t gone back to stalls and given up. Then I spotted her at the far end of the arena, she wasn’t happy but she was hanging in there. I sat next to a dear friend who assured me Lauren would be okay. I wasn’t so sure. Neither was Lauren. The first jump was good. Mickey stopped and refused at the second jump but Lauren stayed on. She got her crop, hit Mickey once to get his attention, circled around, sailed over the jump and finished her course. Dev said that Mickey was jumping as well as he ever jumped and Lauren rode like a pro. Facing down your fears, when you want to quit and give up takes courage. Nothing about this sport is a given. Equestrian sports with the strong connection between horse and rider are exceptionally difficult. What other sport do you share with a thousand pound partner-counting on them to keep you safe? Lauren showed courage (we kind of forced her into it) today and I couldn’t be prouder. Progress comes slowly, invisibly sometimes. When you are waiting for it and watching the signs you do not see it. But turn your head and it has been there all along inching its way toward change. It was quite a compliment to me. Like I had just had someone compliment me on learning a second language. So, yes I have thought in pictures and tonight these two pictures tell a story of a dark, lean filly who has grown up to be a beautiful, white mare. Her owner now would tell you she still needs so much progress. There is still so much she needs to learn. It is true but I (we) must be mindful to not miss what we have accomplished in view of what we have yet to do. There will always be more to learn. More to see, more to do. But I will try to step back and turn my head so I can look again at what I had seen before and view the progress that I have made. As we head into finals season, may all the riders look back at how far they have come to reach their dreams. They may not touch their dreams, maybe not this year, maybe not ever. But each rider that has come this far, be it Zone finals, regional or national finals reflect just a moment, on a year ago, three years ago or maybe even five. If they need a reminder of how far they have come-well, I probably have plenty of pictures that I could show them. Mickey and Lauren both showing the athleticism and team work needed to succeed. Lauren and Mickey went to Dev’s today for another lesson. It was the follow up to last week’s lesson and we will have one more next Thursday. Dev’s parents Terry and Don were there. Both top riders and competitors in their own right, they are a great support system for the Devereaux Sport Horse riders. Don was surprised at how Mickey looked. Usually a true bay (a brown horse with black mane and tail-as you can see in the picture above), Mickey is growing his winter coat and looks almost black. Both Don and Terry thought Mickey looked healthy and happy to be back jumping. Two weeks from today, the Britannia Farm Fall “A” Show will get underway in Katy, Texas. Mickey and Lauren are officially entered. We will start off with a few lower height classes: .90 meters (2’11”) and .95 meters (3’1″) and see how he does. Lauren will move Mickey into the Eq Center on Wednesday and then show the subsequent days. It is like an entire village of horses, trainers, riders and their support systems take over the center. The plan will be to see how Mickey tolerates each round, each day and if he is physically able to keep competing as the fences go up, the courses get tougher and fatigue gathers. While well rested, he is clearly not in his optimum physical shape. If we do reasonably well, in that he is jumping well, pretty competitive in his times and not doing stupid things like refusing fences, then we will feel pretty good headed to Zone finals on November 10th. Inadvertantly, we may have done a good thing by giving Mickey a couple of months off. 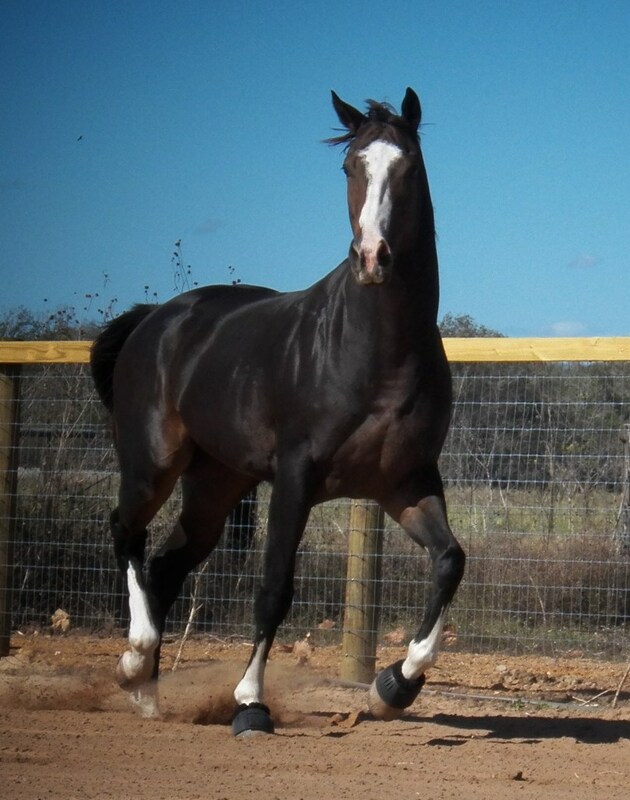 Some horses get ring sour, wear out their legs by overuse and/or just do not want to jump. The horse under Lauren today at Dev’s was rested, healthy, eager and excited about jumping. He may just carry those attributes into the ring with him for finals. And if he is ready for his come back and able to keep the cough at bay, Lauren and Mickey may be real contenders this year. We are certainly in a better spot than we had anticipated and are thankful. It was terrific to hear the excitement in Lauren’s voice today as she told me about her lesson. We will wait and see.